This vintage beach house, nestled in the dunes of Cabana Beach Estates, offers guests the relative seclusion of a private beach community. When you first take the winding gravel road through the neighborhood you’ll feel as though you have stepped back to your childhood before beach living went condo. Most houses in the neighborhood are older and only a few rent to visitors. 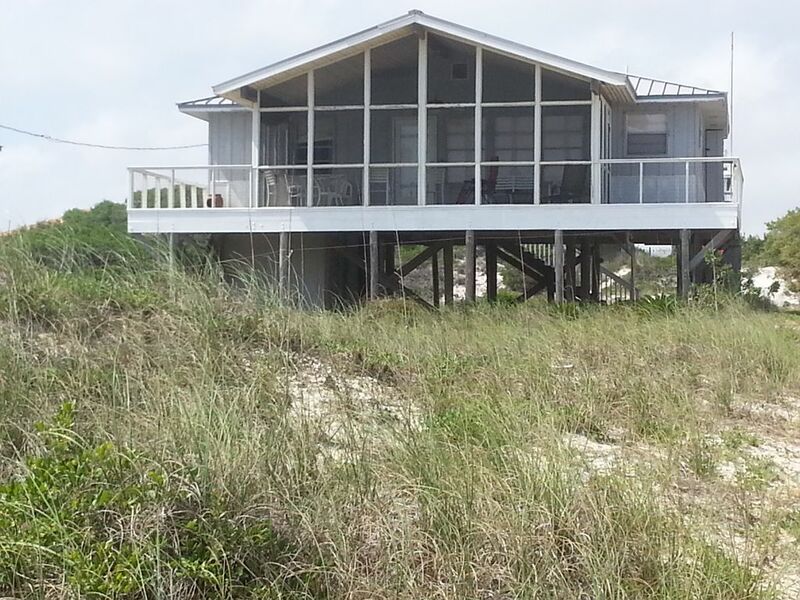 The community has a dedicated beachfront access for the homes that are not located directly on the Gulf beach. A short walk two houses down and across the street make for quick and easy access to the water and back home again. Pull the large-wheeled wagon loaded with your towels and toys from under the house to the beach in just a few minutes. If you enjoy fishing you can go across Ft Morgan Road to Cabana Beach Estate's dedicated bay front area. Here you will find a dock where you can sit and enjoy unobstructed views of the bay's incredible sunsets. Fishermen will love this side of the peninsula. Toss in a crab trap, fishing line or use your cast net to gather dinner. It is truly the best of both worlds, bay and beach. This 1000 sq. ft. home was built in the 1970s and is across the street from the Gulf of Mexico. You will enjoy the vintage feel of a home that has not gone condo. You will appreciate lazy days at the beach where the view and the sound of the surf are the most important things. Even though it is raised on pilings its steps are an easy climb. Upstairs you will find an open central living room with TV and DVD player and comfy seating for nine. The home also has Wi-Fi for those who want to keep up with the world while on vacation. On the west side you will find one queen and one full bedroom with adjoining half bath. On the east side is a smaller room with three twin beds, a newly remodeled full bath and kitchen with beautiful new cabinets and granite countertops. Built before air conditioners were commonplace (don't worry, it has central heat and air now!) the home is designed to catch the cross breeze. You can open up the windows and enjoy the fresh air blowing through the rooms. You’ll love to relax on the screened front porch and enjoy the natural vegetation of the front yard and a fantastic view of the Gulf of Mexico. Sunrise and sunset have never been so beautiful! Downstairs is a full laundry and an outdoor shower with both hot and cold water. It is great for cleaning up the sandiness of a day on the beach before going upstairs. Hang your towels and suits on the clothesline to dry. Under the house is parking for two cars or it can be a great place for kids to play outside in the shade when they've had enough sun. Owners keep a wagon of beach toys for others to use at the beach. If you want to get out and enjoy the sights or eat out you will find both an excellent fine dining restaurant and a less formal eatery at The Beach Club Resort located adjacent to the neighborhood. On holiday weekends, you have an unequaled view of the resort's fireworks displays. A few more miles down Fort Morgan Road are the Sassy Bass and Tacky Jacks; both have full bars and good food. Just east of the neighborhood is The Pines. Its convenience store, gas pumps, pizza place and restaurant mean you may never have to venture far to find the items you need. Historic Fort Morgan is only a fifteen minute drive. The historic fort and museum are great fun for kids and an educational outing. The Fort has reenactments every Tuesday evening and other special events. The summer of 2014 marks their 150th anniversary so this summer will feature even more excitement at the fort. Another great local day excursion is a ferry ride to Dauphin Island. Catch the ferry at the end of Fort Morgan Road (about a 15 minute drive) and spend 45 minutes crossing the mouth of Mobile Bay to the island. While there, visit Fort Gaines, the Dauphin Island Sea Lab and Estuarium, a showcase of the plants, animals, and other natural resources found in the Estuary and its surrounding marine habitats. To make a day of it go on up to a favorite place, Bellingrath Gardens and Homes on the mainland. If you want to make the full circle, travel on up to Mobile and enjoy that historic city and the WWII battleship USS Alabama before returning to the Gulf Shores area. When you pull yourself away from the beach house try a trip in the opposite direction and go 20 minutes into Gulf Shores. Here you find all the usual beachy stuff from souvenir shops to restaurants, adventure golf, grocery stores, sea kayak rentals and waterparks. Explore the whole island and visit Orange Beach, the Gulf State Park, the Hangout, Lulu's, or even take a quick trip over the line into Florida. For nature lovers the Bon Secour National Wildlife Preserve is only five minutes away. They have several hiking trails and guided walking tours. Bird watching is a favorite pastime of visitors to the area as well. Pick up the local Mullet Wrapper or Islander newspapers for schedules of local events and activities. Located across the street from the beach, you only have to walk few yards to access the white sands on the Gulf of Mexico. Some beach toys. Also games. We thoroughly enjoyed our time at Potts Spot. Just enough room for the 6 of us and the view was amazing. We liked the privacy of the home and the beach. Close enough to Gulf Shores to hang out but far enough away to not deal with the crowds. The house was clean and well stocked. Would definitely recommend! Great location, clean and tidy home with everything you need for a getaway. Private beach was definitely a plus. We took our dogs on the beach and they loved it! We went over Christmas and our weather was delightful. Anything we would have needed was just a call away (Martha was a joy). Would highly recommend this location. Had a wonderful vacation at this home. We thoroughly enjoyed our stay at the property. The screened in porch was fantastic. We spent most of our free time relaxing to the sound of the waves crashing on the beach. No issues with bugs with the screened in porch and the view of the water and sand was just what we wanted. Perfect location close to the beach! Being able to bring our elderly dogs along was a huge plus! Dogs, kids, and parents all enjoyed being so close to the beach. The screened in porch was delightful! It was especially helpful with the sand blowing due to the winds brought by Hurricane Michael. We were able to sit outside and watch the ocean while avoiding the sand in the wind. Kitchen had everything we needed and the beds were comfy. Kids loved the bunks and the beach toys. We would definitely visit again! Nestled in the dunes in Cabana Beach Estates, this vintage beach house offers the relative seclusion of a private beach community. When you first take the winding gravel road through the neighborhood you’ll feel as though you had stepped back to your childhood before beach living went condo. Most houses in the neighborhood are older and only a few rent to visitors. The community has a dedicated beachfront access for the homes that are not located directly on the Gulf beach. A short walk two houses down and across the street make for quick and easy access to the water and back home again. Pull the large-wheeled wagon loaded with your towels and toys from under the house to the beach in just a few minutes.